To wrap up 2013, we asked our columnists and contributors to name the wines that have most impressed them over the past 12 months. “I brought this wine over to a friend’s house for dinner back in February, where the ‘main event’ wines were big-name reds from Bordeaux and Burgundy, but this white just blew everything else away. It made everyone around the table smile in recognition of a bloody great wine as soon as they tasted it. This is not inexpensive – a bottle will probably cost you around $180 – but it is so unbelievably complex, with huge persistency and energy, orange peel, toasted almonds, full of power but still precise and vertical: one of those wines that draws itself upwards in the mouth. “Sangiovese is a fickle beast, a little like pinot noir. 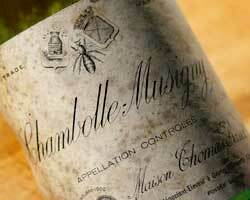 At its best, it has grace and finesse; at its worst, it can taste scrawny and acidic. This is an example of the former tendency, produced in the south-east corner of Montalcino close to the glowering presence of the Monte Amiata. This sublime Riserva was made under the previous owner of the estate – Piero Palmucci, working with the late, legendary consultant, Giulio Gambelli – although little seems to have changed under the new regime since 2011. 2007 was a hot vintage for Brunello, but that doesn’t show in the wine. Is there a ‘Poggio di Sottoness’ that supersedes vintage variation? It would seem so. I’ve tasted it twice this year: once at the Benvenuto Brunello event in February and once at the Top 50 Italian Wine Awards, where it was voted (blind) the best wine in the country by the five judges, including me. Yes, it’s that good. “This has been a wake-up year for Oregon’s once-sleepy wine industry, with several major players, such as Jackson Family Wines, making significant investments in the region. Of even greater interest to aficionados, the influx of talented producers from Burgundy continues. They include Louis-Michel Liger-Belair, who has launched a collaboration with film producer Mark Tarlov, founder of Evening Land Vineyards. 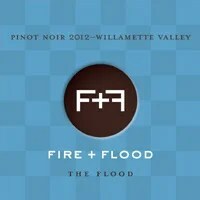 The most interesting of Liger-Belair’s new releases are “The Fire” and “The Flood” – two studies of the Willamette Valley’s most predominant soil types. According to Tarlov, Liger-Belair assembled the cuvées blind, and discovered only later that the vineyard sources for each bottling were, as their names suggest, volcanic and sedimentary. “Rioja is known for producing some time capsules. Unlike Bordeaux, which pre-sells wines while they are still maturing in barrel, wines from the traditional producers of Rioja are often released with a decade or more of age on them. I had the chance to try a really old one earlier this year: a 1945 Marques de Riscal Reserva. “I could have shown off and said my wine of the year was the 1955 Domaine de Chevalier I had at a dinner with the estate’s owners, but how many people would be able to get hold of that? “When did you last see a California wine with 12.5 percent alcohol? Proving that Napa can produce elegant, restrained, long-lived cabernet, this has a lively red-fruit nose with earth and wet stone, crushed rose petals and potpourri. The tannins have lost none of their structure over three decades, with a lovely dry, fine-grained texture throughout, until – and you’ve been wondering where they’re going – they dissolve on the tongue into a juicy, food-friendly finish. It is the very essence of power with finesse, alive, fresh and with at least another three years before it begins a gentle descent into a long and venerable old age. “My wine of the year isn’t something particularly expensive, but that said, you won’t find one down at your local supermarket either. I often buy selections of older wines at auction and this was one such bottle: not a grand cru, not even a premier cru, just a modest villages red Burgundy from a (then) well-reputed producer and vintage. Good company, of course, added to the experience, but we all fell silent as we sniffed – over and over again we sniffed – taking in those beguiling sweet fruits. Could the taste possibly match the nose? It could. Complex, enveloping, cosseting and with a beautiful balance – indeed, grace. It stopped us all in our tracks. “For me, the element of surprise is crucial, making some wines stand out head and shoulders above the crowd, and the bigger the surprise the more memorable the wine. This year I spent a great deal of time traveling around the wine regions of North America which produce riesling in order that my forthcoming book, ‘Best White Wine on Earth,’ is fully up to date. Everywhere I went, riesling was more or less on a roll. 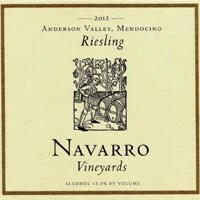 However, nothing prepared me for the brilliance of the 2012 dry Riesling from Navarro Vineyards in the Anderson Valley. With a ravishing bouquet of white peach and flowers, succulence, vibrancy and intensely mineral finish, it was everything a great dry riesling should be. “I tried this wine on a tasting trip to Barolo during the summer and it blew me away for its freshness, balance and depth – proving that even in a difficult vintage like 2009, quality-minded producers can still make great wine. “Three days of Riesling Rendezvous tastings and seminars left me with many candidates for my wine of the year selection, but the final decision was easy. The 2012 Eroica Gold Riesling raises the bar for American rieslings in terms of style, quality and price (pushing through the $20 glass ceiling that some believe has limited the quest for quality in this country). I think this wine is a game-changer and I’m counting on it to open the eyes of American riesling drinkers. If you love the structure of Cabernet Sauvignon but the fruitiness of Grenache then you’ll love Tempranillo. It’s big wine with high tannin that will buddy up to any piece of rich meat. Tempranillo is a popular grape that grows everywhere, but its homeland is Spain. In Spain, the region famous for Tempranillo is Rioja. Unlike American wine, Rioja uses a system of qualifying their wines making it pretty easy to find what you like. So how are the wines of Rioja classified? One of the primary qualifications between the different styles is oak-aging. Very basically: the more oak, the higher the quality level. Let’s take a closer look at the different types of red Rioja. Rioja has a wine control board, called the Consejo Regulador DOCa Rioja, who inspects the quality of producers to ensure consistency. This is a benefit because wines from Rioja labeled ‘Crianza’ will have a similar taste profile. There are 4 different main styles of Rioja wine. The best way to taste the range would be to taste all 4 next to each other – perhaps a perfect excuse to host a wine tasting party. Rioja used to be called “vin joven” which literally means “young wine.” Now when a wine is labeled ‘Rioja’ and it’s the base-model Tempranillo, they are baby Tempranillo wines without all the tannin (or the richness) of the other classifications. What they don’t have in structure they make up for in zippy fruit. Try this level of Rioja as a great example of the true varietal characteristics of Tempranillo wine. Crianza is perhaps the most accessible level of Rioja wines, especially since most can be found for less than $15. At the Crianza level, the wines are most commonly aged in used oak, so the oak flavors are not as strong. The goal of Crianza is a high-quality daily drinking wine. It’s not too rich, but with Tempranillo’s natural high tannin it has quite a bit more body than Merlot. It’s like a great valued Cabernet Sauvignon. Love Spanish wine? Get a Spanish wine map of all 60+ unique regions. This is where Rioja tastes serious. At the Reserva level, winemakers often age their wines longer than the minimum and select better grapes. Many Rioja wine enthusiasts swear by Reserva level because they are a medium between super fruity Crianza and oakey-bottle-aged Gran Reserva. The Gran Reserva level of Rioja experiences the most oak-aging. This gives Rioja wine the most tannin structure and age-worthy potential. What’s interesting about Gran Reserva is that most winemakers select the best grapes for this level and age them for as long as the wine needs. This means most of the new release Gran Reservas are around 10 years old or older when you first see them available. Gran Reserva Rioja are ideal wines to cellar up to 30 years. There’s a new style of winemaking happening in Rioja. Modern Rioja wines use more French or Hungarian oak (instead of American oak) to make a smoother and rounder wine – usually with less acidity. While these wines are often touted as lacking Rioja’s traditional earthiness, they are a growing category because of high ratings. Need a few recommendations for modern styled Rioja producers? We enjoyed Vivanco , in Rioja Alta; Baron de Ley , in Rioja Baja and Izadi , in Rioja Alavesa. A castle on a hill in front of the Cantabria Mountains in Rioja Alta. Rioja is in North Central Spain. It’s about 2 hours drive from Bilbao in a valley along the Ebro River. The entire valley is moderated by the Sierra Cantabria, a small but jagged mountain range that stops clouds from coming into the Rioja valley. Besides wine, the area is known for its delicious tiny artichokes, white asparagus and piquillo peppers. For wine, the area is split into 3 sections: there’s Rioja Baja, Rioja Alta and Rioja Alavesa (next to Alava). Most people will tell you that Rioja Alta and Rioja Alavesa are better than Rioja Baja but that’s not always the case. You can find great Rioja wines from all over, just pay attention to producer and vintage. In Rioja Alta the temperatures are cooler and the elevation is about 300m higher than Rioja Baja. Because of the elevation and cool temperatures, wines from Rioja Alta have higher tannin and acidity than Rioja Baja – they also tend to be more elegant. The soils in parts of Rioja Alta have a lot of iron oxide giving them a red hue with a high proportion of clay. Rioja Alavesa is next to the neighboring region Alava and also next to Rioja Alta. The wines in Alavesa are more similar to Rioja Alta. There are more rolling hills in these two regions and the best vineyards are on south facing slopes. Around Rioja Alta and Alavesa you can find many ancient fortified castles and monasteries on hilltops. In Rioja Baja the vineyards are on the flatlands going towards the Ebro river. The soil is more consistent with mostly calcareous soils called Cascajo with stones from ancient floods. The wines from this region are more fruit-forward and the new wineries in the region focus on a richer style wine that’s rounder and more lush. You can still find the characteristic fig flavors in older wines from this region, but generally the wines form Rioja Baja are designed to drink right away.